Guest Post: Review of Dan Brown's "Angels and Demons"
Book Review: Terry Pratchett's "Raising Steam"
Mr. Pratchett's latest offering to us is a wonderful read, in my opinion. I've seen other reviews where people lamented that his declining health was clearly showing in this book saying things like "it wasn't as funny..." or "...it felt like this was his farewell to the fans..." etc. A lot of this is understandable considering the rare form of alzheimer's he is fighting. 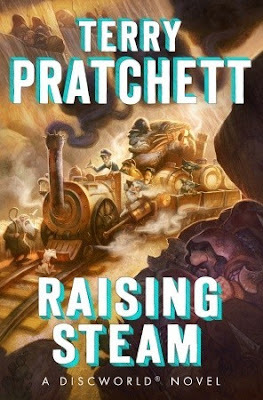 But for me, this book felt more like a wonderfully wild ride that took us to various parts of the Discworld, just as the invention of the first train in Ankh-Morpork intended.